I am on a weight loss journey. Before I got pregnant with my daughter I had just gotten down to a comfortable weight for myself and of course gained a ton back with pregnancy. I have been losing weight but My New Years Resolution was to drop the rest of my baby weight and I think that the Bulu Weight Loss Box is going to greatly aide me in that! There are two different versions of the Bulu Box, the regular and the Weight Loss and I feel like the latter suits me best. 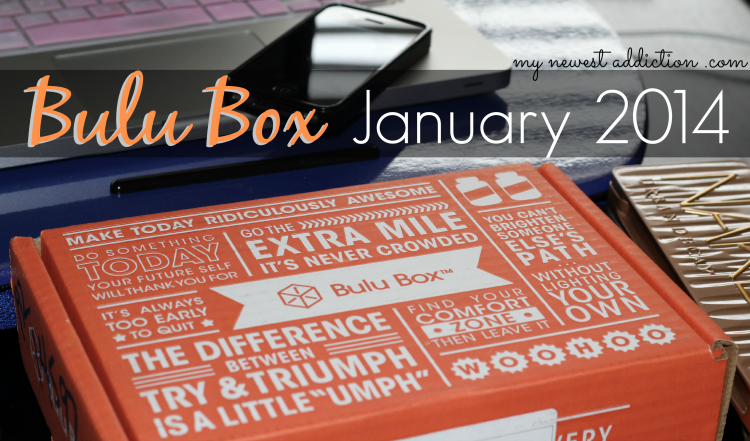 I have reviewed the Bulu Box here before, and am very excited to show you the things I got in the January 2014 box. 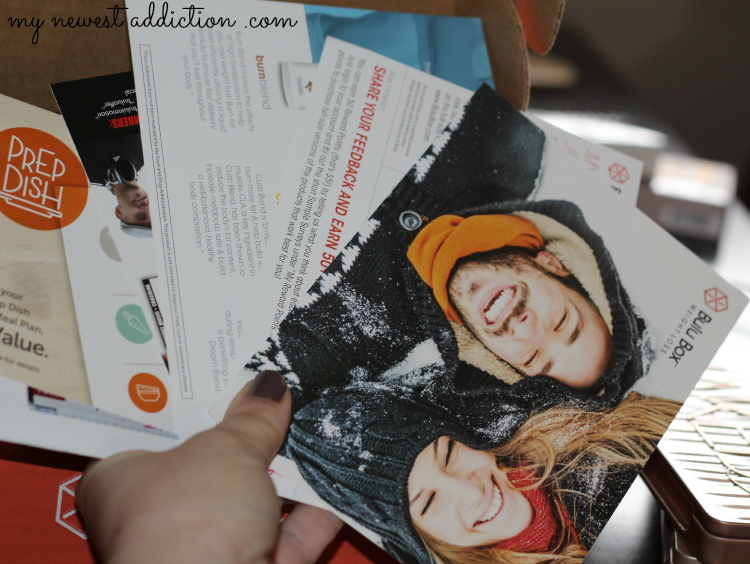 This box had a ton of inserts and cards, some are just more info on the product samples but some have added values in addition to the the samples. There is a box for a free week of Prep Dish, which is a service that helps you plan your meals. It is a $14 value. I don’t know about you, but I could really use help with meal planning. In my house we have no set plan every week. We play it by ear and sometimes that ends up with bad-for-us food. On the back of the Prep Dish card is a recipe for 3 ingredient cookies and one of those ingredients IS NOT flour! Whoop! Another one that was a great value was the Cardio Star phone app for your phone. You can get a FREE COACHED TRACK and 25% off of your first purchase. There is also a card that includes coupons for the products mentioned in this box and mentionings of Curated Shops. The other cards included are info on the box. The Sample Journal to help you decide how things worked for you. 1. Shapeology Burn Blend – This pill mimics the effects of high metabolism to help you lose weight fast. The bottle has 14 liquid capsules, which is a 1 week supply. I am definitely looking to burn fat more efficiently so I am happy to be able to try it out for an entire week to see if it works for me before committing to the full size bottle or even the kit. 2. Helps Breathe Tea – This is a tea sachet that helps you to relax and rest. Rest is important in weight loss. You have to give your body time to recoup after working out. This tea’s ingredient list reads: Organic Lemon Balm (Leaf), and Organic passion flower (Aereal part). Yep… that is it. K.I.S.S. Keep It Simple Stupid is definitely their philosophy! 3. Smarty Pants Weight Management – These are tummies that are FANTASTIC. I have already eaten them all up. I don’t know if you know or remember but I am not allowing myself to keep candy in my purse and these are PERFECT for keeping me healthy and away from candy. It is a full multivitamin as well as containing Omega 3s, Vitamin D3, fiber, and contains no added sugar. Not even kidding. I am buying this! 4. Wiley’s Finest Peak EPA (Wild Alaskan Fish Oil) – This is a dietary supplement that has 1000mg of EPA + DHA + Omega 3 per serving. It MAY also reduce the risk of coronary heart disease. The Fish oil is produced in Alaska from wild Pollack caught in US waters. Then they purify and gently concentrate the oil up to 85% Omega-3 to provide the Peak dose in every softgel. I have been interested in adding Fish Oil into my supplements for a while because there are tons of benefits. Beauty health and weight management. What was my favorite item? The Smarty Pants gummies! They are seriously delicious and have things in them that I need anyway! I am purchasing these as soon as I get done writing this post!!! 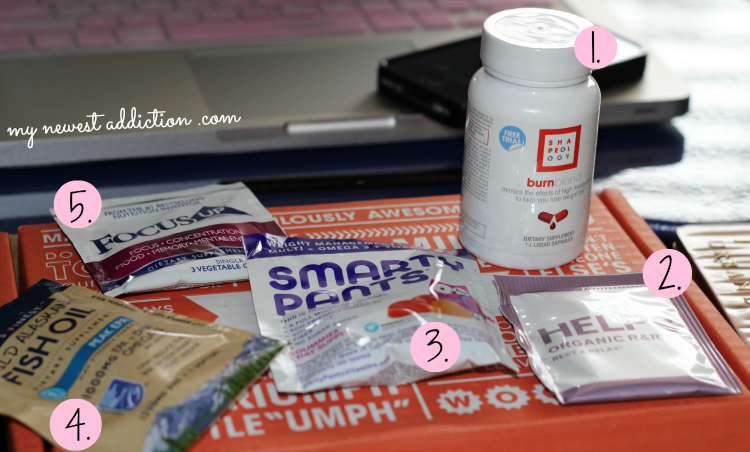 Overall I was really impressed with Bulu Box. The subscription services costs $10 a month. You can subscribe month-to-month, quarterly, every 6 months, and once a year. If you choose the yearly subscription you can essentially get one of the months free. You can use my referral code “BULUGAN136” to get 50% off, so I encourage you to get the largest subscription service available/you are comfortable with because you can only use the coupon once.